After his inauguration in January 1989, George H.W. Bush did not automatically follow the policy of his predecessor, Ronald Reagan, in dealing with Mikhail Gorbachev and the Soviet Union. Instead, he ordered a strategic policy re-evaluation in order to establish his own plan and methods for dealing with the Soviet Union and arms control. Conditions in Eastern Europe and the Soviet Union, however, changed rapidly. Gorbachev’s decision to loosen the Soviet yoke on the countries of Eastern Europe created an independent, democratic momentum that led to the collapse of the Berlin Wall in November 1989, and then the overthrow of Communist rule throughout Eastern Europe. While Bush supported these independence movements, U.S. policy was reactive. Bush chose to let events unfold organically, careful not to do anything to worsen Gorbachev’s position. With the policy review complete, and taking into account unfolding events in Europe, Bush met with Gorbachev at Malta in early December 1989. They laid the groundwork for finalizing START negotiations, completing the Conventional Forces in Europe treaty, and they discussed the rapid changes in Eastern Europe. Bush encouraged Gorbachev’s reform efforts, hoping that the Soviet leader would succeed in shifting the USSR toward a democratic system and a market oriented economy. Gorbachev’s decision to allow elections with a multi-party system and create a presidency for the Soviet Union began a slow process of democratization that eventually destabilized Communist control and contributed to the collapse of the Soviet Union. Following the May 1990 elections, Gorbachev faced conflicting internal political pressures: Boris Yeltsin and the pluralist movement advocated democratization and rapid economic reforms while the hard-line Communist elite wanted to thwart Gorbachev’s reform agenda. Facing a growing schism between Yeltsin and Gorbachev, the Bush administration opted to work primarily with Gorbachev because they viewed him as the more reliable partner and because he made numerous concessions that promoted U.S. interests. Plans proceeded to sign the START agreement. With the withdrawal of Red Army troops from East Germany, Gorbachev agreed to German reunification and acquiesced when a newly reunited Germany joined NATO. When Saddam Hussein invaded Kuwait, the United States and the Soviet leadership worked together diplomatically to repel this attack. Yet for all of those positive steps on the international stage, Gorbachev’s domestic problems continued to mount. Additional challenges to Moscow’s control placed pressure on Gorbachev and the Communist party to retain power in order to keep the Soviet Union intact. After the demise of Communist regimes in Eastern Europe, the Baltic States and the Caucasus demanded independence from Moscow. In January 1991, violence erupted in Lithuania and Latvia. Soviet tanks intervened to halt the democratic uprisings, a move that Bush resolutely condemned. By 1991, the Bush administration reconsidered policy options in light of the growing level of turmoil within the Soviet Union. Three basic options presented themselves. The administration could continue to support Gorbachev in hopes of preventing Soviet disintegration. Alternately, the United States could shift support to Yeltsin and the leaders of the Republics and provide support for a controlled restructuring or possible breakup of the Soviet Union. The final option consisted of lending conditional support to Gorbachev, leveraging aid and assistance in return for more rapid and radical political and economic reforms. Unsure about how much political capital Gorbachev retained, Bush combined elements of the second and third options. The Soviet nuclear arsenal was vast, as were Soviet conventional forces, and further weakening of Gorbachev could derail further arms control negotiations. To balance U.S. interests in relation to events in the Soviet Union, and in order to demonstrate support for Gorbachev, Bush signed the START treaty at the Moscow Summit in July 1991. Bush administration officials also, however, increased contact with Yeltsin. 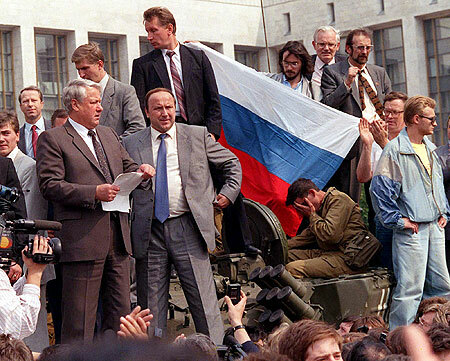 The unsuccessful August 1991 coup against Gorbachev sealed the fate of the Soviet Union. Planned by hard-line Communists, the coup diminished Gorbachev’s power and propelled Yeltsin and the democratic forces to the forefront of Soviet and Russian politics. Bush publicly condemned the coup as “extra-constitutional,” but Gorbachev’s weakened position became obvious to all. He resigned his leadership as head of the Communist party shortly thereafter—separating the power of the party from that of the presidency of the Soviet Union. The Central Committee was dissolved and Yeltsin banned party activities. A few days after the coup, Ukraine and Belarus declared their independence from the Soviet Union. The Baltic States, which had earlier declared their independence, sought international recognition. Amidst quick, dramatic changes across the landscape of the Soviet Union, Bush administration officials prioritized the prevention of nuclear catastrophe, the curbing of ethnic violence, and the stable transition to new political orders. On September 4, 1991, Secretary of State James Baker articulated five basic principles that would guide U.S. policy toward the emerging republics: self-determination consistent with democratic principles, recognition of existing borders, support for democracy and rule of law, preservation of human rights and rights of national minorities, and respect for international law and obligations. The basic message was clear—if the new republics could follow these principles, they could expect cooperation and assistance from the United States. Baker met with Gorbachev and Yeltsin in an attempt to shore up the economic situation and develop some formula for economic cooperation between the republics and Russia, as well as to determine ways to allow political reforms to occur in a regulated and peaceful manner. In early December, Yeltsin and the leaders of Ukraine and Belarus met in Brest to form the Commonwealth of Independent States (CIS), effectively declaring the demise of the Soviet Union. On December 25, 1991, the Soviet hammer and sickle flag lowered for the last time over the Kremlin, thereafter replaced by the Russian tricolor. Earlier in the day, Mikhail Gorbachev resigned his post as president of the Soviet Union, leaving Boris Yeltsin as president of the newly independent Russian state. People all over the world watched in amazement at this relatively peaceful transition from former Communist monolith into multiple separate nations. With the dissolution of Soviet Union, the main goal of the Bush administration was economic and political stability and security for Russia, the Baltics, and the states of the former Soviet Union. Bush recognized all 12 independent republics and established diplomatic relations with Russia, Ukraine, Belarus, Kazakhstan, Armenia and Kyrgyzstan. In February 1992, Baker visited the remaining republics and diplomatic relations were established with Uzbekistan, Moldova, Azerbaijan, Turkmenistan, and Tajikistan. Civil war in Georgia prevented its recognition and the establishment of diplomatic relations with the United States until May 1992. Yeltsin met with Bush at Camp David in February 1992, followed by a formal state visit to Washington in June. Leaders from Kazakhstan and Ukraine visited Washington in May 1992. During his visits to Washington, politics, economic reforms, and security issues dominated the conversations between Yeltsin and Bush. Of paramount concern was securing the nuclear arsenal of the former Soviet Union and making certain nuclear weapons did not fall into the wrong hands. Baker made it clear that funding was available from the United States to secure nuclear, chemical and biological weapons in the former Soviet Union. The Nunn-Lugar Act established the Cooperative Threat Reduction Program in November 1991 to fund the dismantling of weapons in the former Soviet Union, in accordance with the START and INF Treaties and other agreements. Bush and Baker also worked with Yeltsin and international organizations like the World Bank and IMF to provide financial assistance and hopefully prevent a humanitarian crisis in Russia.